I have been rv'ing for over 50 years. Defective post wiring burned out my roof air. Paid the monthly rate. Wife had a medical emergency and was hospitalized, had to leave a week early. They recalculated the monthly rate to a daily rate so I owed $200 more! Our RV space was 130. Looks like it had not been maintained in years. Horrible experience, we will never return! We camped at Hon-Dah Casino RV Park in a Motorhome. Pull thru, not very level but adequate. Older park, but had full hookups with very close reach. Quite a few full time guests with kids. 17 local TV stations off antenna. I would stay here again. We camped at Crazy Horse RV Campground in a Motorhome. Very very expensive for a dirt lot. We camped at The Cove RV Resort (formerly Riviera RV Resort and Marina) in a Motorhome. There are over 30 spaces here. Super convenient to Interstate 10. All spaces are pull thru. Full hookups. Some lots have trees if you want them. Many don't. We were directed to space 16 together pay for our spot. Park is on the south side of Interstate 10 and is just a few yards west of the gas station. Super easy pull thru. Do not see any TV hookup. Zero local channels. Worth driving west past Fort Stockton to save money. 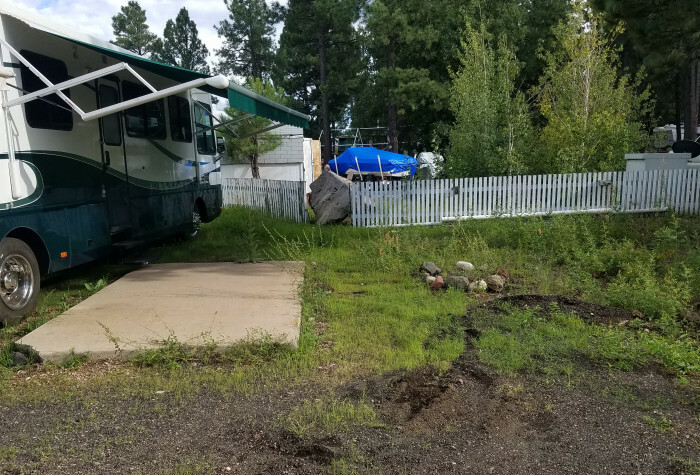 We camped at Saddleback Mountain RV Park in a Motorhome. No negatives. Grass lot, all are mowed. Train noise day only. Road noise but not terribly. Office not always attended. Just pick a spot and you will be eventually contacted. Park is currently up for sale and current owners are putting zero dollars into improvements. Pull through sites always full but back in sites are very easy access. Short dirt access road is ok, not a pot hole obstacle course. WiFi works. Verizon cell works, zero access for Sprint. We camped at R V Relay Station in a Motorhome. Good restaurant a quarter mile down the road. Space 73 is for handicapped tags only and is the best space in the park. Large, flat, water and 50 amp service. No trees obstructing satellite service. Right next to showers. Most spaces are challenging for big rigs but this can handle a 40 foot rig with very easy back in. Close to Kingsport TN and many restaurants, fuel and Walmart. We camped at Warriors Path State Park in a Motorhome. Hard to rate. Very old park. Excellent 50 amp, WiFi and cable TV. Picnic table and trash container on every lot. Emptied daily. Lots of permenant old RV's. Stay 7 days get one free. Easy access to hookups. But I have never been in a park with neighbors so close! With tax comes to over $38 a day. I would stay here again but it should be a $28 fee for what you get. We camped at Dixie Caverns Campground in a Motorhome. Visit the cave. Prepare for over 300 steps. Zero handicap access. $220 a month plus electric at 13 cents per kWh! Open all year. I am shocked at these low prices! It is not a 5 star park but it is very nice. Nice level gravel lots, 30 & 50 amp service, sewage and water and over 50 cable channel and great Wi-Fi! Exit 79 on interstate 40 and just follow the signs for a few hundred yards. There are 25 restaurants within 5 miles of this park. Every lot has a pine tree that does not block satellite signals. Most lots are pull-through. I am not affiliated with this park and just passing it on as an unbelievable bargain. We camped at Bar S RV Park in a Motorhome. Walmart, Loves, MacDonalds, Smiths Grocery, Engine repair next door. This is an amazing bargain for full time RVers. Price is for month stay. These people treat you right. We requested a concrete pad and we got it. The 50 amp receptacle was wonky and they replaced it immediately and it was the 4th Of July weekend! There are no issues with the gravel lots or the concrete drives. Everything is in tip top shape. Monthly rate does not include electric. Over 120 channels of digital cable but you have to use their cable box. Internet is $30 a month but is the fastest I ever saw in an RV park, clocking at 10 Mbps. Show Low is loaded with restaurants and an amazingly stocked RV store in Lakeside, AZ only 8 miles away. You will not be disappointed if you stay here. Back-in sites - but they are an easy back in. Camp host escorted us to our space. They have a free computer club room with more than 8 computers. Free. They also have many activities planned here. We will definitely be back. We camped at Venture In RV Resort (55+ park) in a Motorhome. This park is a hidden jewel! Normally $30 but only $15 with your Federal Discount Pass (America The Beautiful etc). Clean as can be, lots of employees taking care of it. You can book online but we just showed up and stayed for four nights. 50 amp pull through sites with water. Beautiful view over a lake. No trees that disrupt satellite. Do not expect your cellphone to work (ATT does work sometimes). This is right at the foot of the Sequoia National Forest which is just up the road. The RV park was 95% empty and I was shocked. This should be a target destination for everyone! We camped at Tule COE in a Motorhome. Go North on 190 from the park to Springerville for great Mexican food. The people in the office could give all other rv parks lessons on courtesy and service! I had a problem with the cable TV hookup and it was taken care of immediately. Three hours later came a knock on the door and they asked if it was still working on. Clean, well maintained Park. 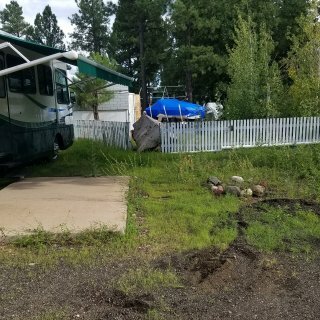 We camped at Boulder Creek RV Resort in a Motorhome. Everything everyone said before me is true. But, I am very pleased to have stayed at this park. It has the strongest no excuse internet I have ever experienced in an RV park and I have been in many. The movie 3:10 To Yuma was filmed here. The rock formations are beautiful. The way in is a dirt road but a very good one. There is no signs to reference that they have RV parking. Just keep going :) I would highly recommend this park to my friends. We camped at Triangle T Guest Ranch in a Motorhome. I agree will all previous reviews. This place is highly overpriced. No internet access. Another KOA without internet. They charge a $5 per person fee because of Utah law requiring every guest to register and insurance regulations. What's with that? We camped at Brigham City / Perry South KOA in a Motorhome. What a nice park! Our second year staying here. Lots of trees, but we still got satellite. Small park, but big on charm. You will look hard to find a nicer park than this for $15. Very friendly staff. Dump station available. Thirty amp electric. Easy access from Interstate 80 and very quiet. We camped at Lafayette Park Campground in a Motorhome. I would stay here again. Sites are tight together, but easy pull through access. Were a Saturday arrival at 1PM and found a note on the office door saying the employees were having a party and to call a telephone number for assistance. Assistance came quickly. Was informed Internet has not worked all summer and that a new system is on order. How many times have I heard this excuse? Must be a lot of Internet systems on backorder! All in all a good place to stop. They have a lot of RV spaces. We camped at Laramie KOA in a Motorhome.